TDTradition Sportfishing Charters - 6 Pack Charters: Sportfishing and Whale-Watching Charters from LA/SD locations; 22nd Street Landing and Dana Landing fishing the So-Cal Mexican Border and Catalina/Clemente Island. Welcome to TDTradition Sportfishing Charters a full service ocean experience. 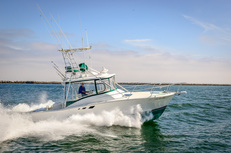 Whether you are looking for a Private Charter to fish the Southern California to Mexican waters or awe inspiring Whale Watching Tours, look no further as we are here to serve you. It's what we do and it's what we've been doing for over 50 years, We have a passionate world-class staff that is sure to make your trip lot's of fun! We provide highly educational Harbor and Whale Watching Tours. ﻿﻿﻿﻿﻿﻿Judith Ann II, is a LUHRS 32 Open, a proven high performance luxury Sportfisher with a cruise speed of 20 knots and a Tower for offshore site fishing. When it comes to amenities she's loaded Including: generator, T.V., stereo radio, refrigerator/freezer, microwave, stove-top, coffee maker, spacious salon for dining and sleeping to include a full restroom with V-Birth/Stateroom providing comfortable sleeping quarters for four passengers. She has a large bait capacity and is equipped with Furuno Electronics and Navigation Radar. Boat is furnished with high quality Shimano TM Tackle for both day and overnight trips. She boasts "Twin Yanmar Diesel Engines!" These engines are amazingly quiet, produce virtually no smoke, with 630 horsepower! We will get you to the fishing grounds faster than ever in both comfort and style with ample fuel capacity to get the job done.